Soraa, the world leader in GaN on GaN™ LED technology, today announced it has added lower and higher wattage 120V MR16 GU10 LED lamps to its product portfolio. The 5W lamps are perfect replacements for 35W equivalent halogen lamps, and the 9W LED lamps replace 65-75W halogen lamps. 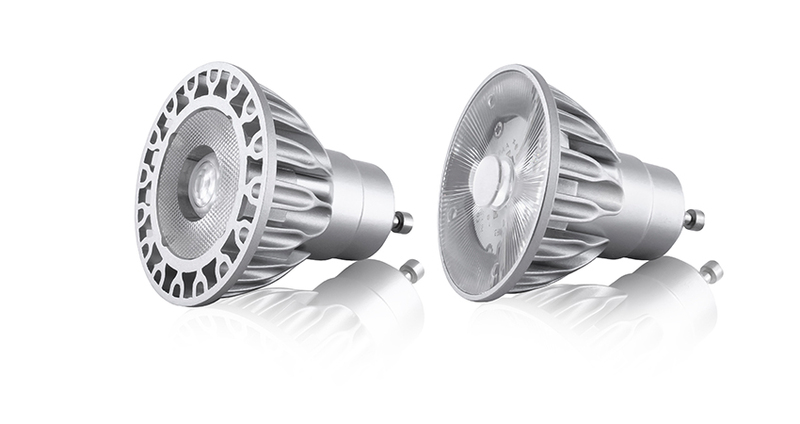 These two new lines join the company’s existing line of 7.5W lamps (50W halogen equivalent). Soraa’s VIVID GU10 LED lamps produce unmatched peak intensity at a 25° beam angle; provide flawless beam definition and smooth beam edges; and have exceptional color (CRI of 95 and R9 of 95) and whiteness rendering. Soraa’s POINT SOURCE OPTICS™ technology features full visible spectrum GaN on GaN LED with a unique folded optic with precision-cut prismatic lenses. The result— crisp, high-intensity and uniform beams. Soraa’s Violet-Emission 3-Phosphor (VP₃) LED technology allows for perfect rendering of colors and whiteness. Utilizing every color in the rainbow, especially deep red emission, Soraa’s VP₃ VIVID COLOR™ renders warm tones beautifully and accurately. And unlike blue-based white LEDs without any violet emission, the company’s VP₃ NATURAL WHITE™ is achieved by engineering the violet emission to properly excite fluorescing brightening agents including natural objects like human eyes and teeth; as well as manufactured white materials such as clothing, paper and cosmetics. Soraa’s new 5W and 9W GU10 lamps are compatible with a wide variety of dimmers and are available in three different beam angles as well as 2700K and 3000K color temperatures.